Pope still awaits his first international cap, with Jordan Pickford preferred by Gareth Southgate to start in goal against the Super Eagles, while Heaton remains on standby ahead of the World Cup. Both made the bench, along with Jack Butland, as goals from former Claret Gary Cahill and skipper Harry Kane saw off Nigeria. England were ahead after only six minutes as two former Clarets combined, Cahill thumping in a header from Kieran Trippier’s inswinging corner, after Trippier had a free kick turned round the post by Francis Uzoho. The first half was one-way traffic, with Pickford barely tested, as England used the pace and movement of Dele Alli, Jesse Lingard and Raheem Sterling to good effect. Sterling, under the microscope all week, could and should have added to his two England goals, while Cahill and John Stones were a big threat from set pieces. Two minutes after the restart, Nigeria halved the deficit as former Watford striker Odion Ighalo was allowed to get his shot away and hit the post, with Alex Iwobi finishing the rebound - to the delight of a boisterous away support, most resplendent in what looks the best strip at the World Cup. Neither side seriously threatened again, however, with Sterling booked for diving into Uzoho after nicking the ball past the keeper from Eric Dier’s pass, to round off an eventful week for the Manchester City wideman. 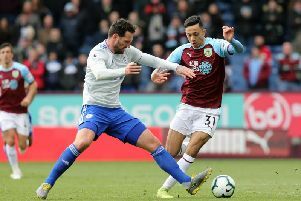 Pope will hope to win his first England cap on Thursday night in England’s last friendly against Costa Rica at Elland Road, ahead of the flight to Russia.